PTO Driven trailers or "Driven Trailers" are trailers which take power from a tractor's PTO to provide drive to the trailer's wheels. This function can only be achieved using a tractor's Ground Speed PTO. Thus, the trailer is no more being 'pulled' but is moving simultaneously with the tractor giving both the tractor and trailer a 6 wheel drive ability. 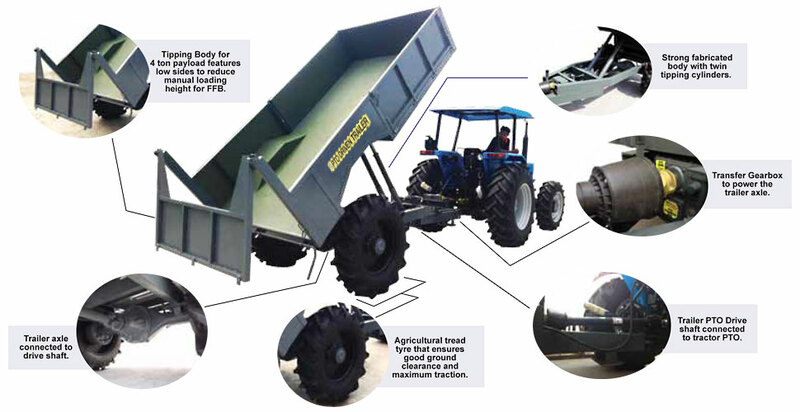 PTO Driven trailers are the best alternative in very adverse conditions on farms and plantations. In these difficult conditions, the PTO Driven Trailer enables you to collect your crops or move your supplies during rainy seasons while reducing tractor wheel slippage and minimising field road damage. Bin Dimensions: 11'(L) x 22”(H) x 78” (W). Tractor Ground Speed PTO required for power to the trailer live axle. Live rear axle (optional parking brakes). Tyres: 12.4-24 or 13.6-24 (Agriculture tread) for traction. (optional: side opening drop doors). Tractor and trailer becomes a full 6x6 wheel drive vehicle instead of a 4x4 wheel drive tractor pulling a trailer. Full traction from the tractor up to the trailer wheels so traction is always guaranteed when climbing hills or in wet conditions. Better load distribution as all wheels are in contact with the ground meaning all wheels can contribute going uphill or to provide engine braking when going downhill. Less stress and maintenance on axles and transmission. The tractor's axles are working with much more proper loads, reducing overloading failures. Less horsepower from the tractor required to haul the same loads as to carry/transport a load is more efficient than to pull. Less horsepower required means less fuel consumption. Difficult areas are now easier to access using this system thus productivity of farms and plantations will improve. Less field road damage as minimal tractor wheel spinning. This reduces road maintenance cost in the long term.